From Vancouver BC’s R&B Brewing comes the “Double India Pale Ale” the newest beer in their brand new Mount Pleasant Series of beers. The beer pours a golden colour with a white head. The aroma consists of floral hops, citrus, melon, almost tropical and some caramel. The flavour is of melon, citrus, tropical, earth, resin, caramel, brown sugar sweetness, bitterness and some alcohol. The alcohol content comes in at 8.8% with an IBU of 70. I am a huge fan of the style and I am happy to see R&B jump into the ring with a tasty one. Commercial Description: A nicely complex IPA with a simple malt profile and deep hop aromas — brewed with Columbus, Centennial, Chinook, Vic Secret and Galaxy hops. The ale is double dry hopped to achieve hop aroma and flavours of citrus, tropical fruit, floral and resin, which gives this beer its specific flavour profile. 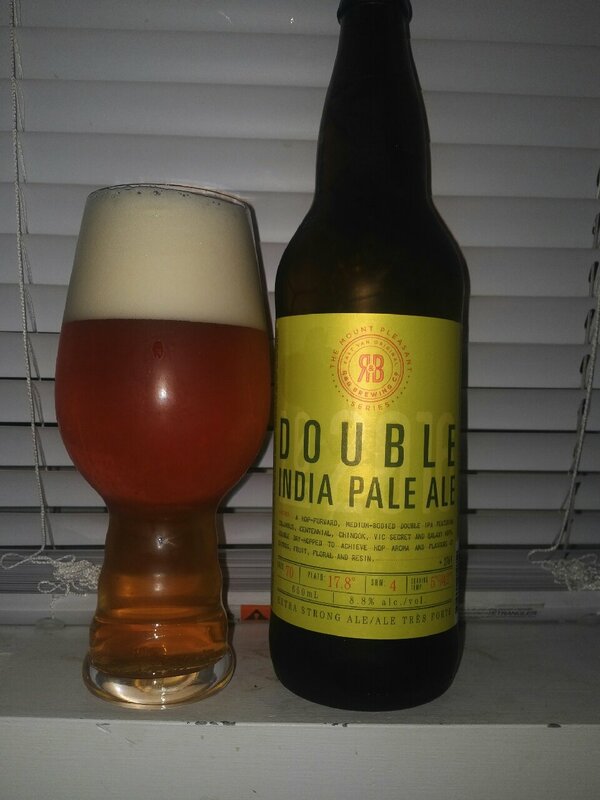 This entry was posted in Double IPA, Imperial and tagged bc, bitter, bitterness, brown sugar, caramel, citrus, craft beer, double india pale ale, double ipa, earth, hopped, hops bitter, hops bitterness., imperial, melon, r and b brewing, R&B Brewing, resin, sweet, sweetness, trofpical fruit, tropical fruits, vancouver.